Mike's Best Blog Ever: How ironic. Another day and I would have completed my tunnel. How ironic. Another day and I would have completed my tunnel. 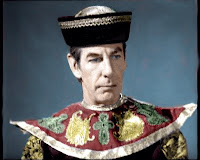 For over sixty years, Michael Gough was a stellar character actor. And, as usual, I only know him for his forays into the fringes rather than his EXTENSIVE stage career and hundreds of dramatic roles. Fiendish inventor of the killer android Cybernauts. Wonderland's potty March Hare and Underland's elderly Dodo. Twice a powerful foe to the Doctor, once an off-screen husband to the Doctor's companion Polly. Gough seized the screen in memorable films from 'Top Secret' to 'Sleepy Hollow'. THAT VOICE! The man was amazing even when you couldn't see his sublime expressions. He made me laugh, he made me cringe, he sold me Coke. The game is ended, Celestial Toymaker, until next time. Rest in Peace, Michael Gough.